We’re in the final countdown to the Gilmore Girls revival! I have a feeling I know what a lot of people will be doing this coming Friday, if they’re not out Black Friday shopping! I really hope it’s just as good as the original series was and that it hasn’t been all hype. It would be such a downer for it to not be as good. Here’s to hoping! Will you be one of the many watching? Speaking of Black Friday… are you a die hard Black Friday shopper, waiting in line for stores to open, fighting the crowds for insane deals OR are you an online shopper? I’m 90% online this time of year. I avoid the mall at all costs until February. I’m not a fan of crowds. I’d much rather find what I need online, when possible, and have it shipped. And this time of year, most stores seem to offer great shipping deals anyway! That kind of makes it a no brainer! We were all a bit shocked over the weekend with how cool it got. We shouldn’t be complaining or surprised…it is almost December after all! I’m not sure how that happened, but it did! I wish I could stick my fingers in my ears, close my eyes real tight and pretend that Winter isn’t really coming. I may have to put on some red shoes and click my heels together in a few months. I’m not ready for snow and super cold temps quite yet. Speaking of… I’m already seeing so many areas that are getting snow! That isn’t a good sign of things to come. Too early for this nonsense! What’s better than Thanksgiving? Thanksgiving leftovers! Even as a kid, I’ve always been a huge fan of sneaking into the fridge and grabbing pieces of cold turkey. Leftovers are quite possibly the best part about the holiday. But, turkey sandwiches can get old and boring real fast. Every year I like to come up with fun new ways to enjoy the leftovers! 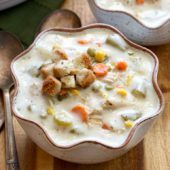 Some past favorites… turkey shepherd’s pie, slow cooker turkey and stuffing dumpling soup, leftover Thanksgiving turkey pizza An absolute must see! And… turkey enchiladas! 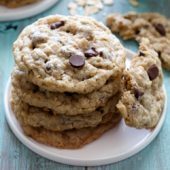 All completely delicious and definite must makes! Fun and exciting ways to change up otherwise basic leftovers! This year, I did a fun twist on one of my absolute favorite soup recipes. 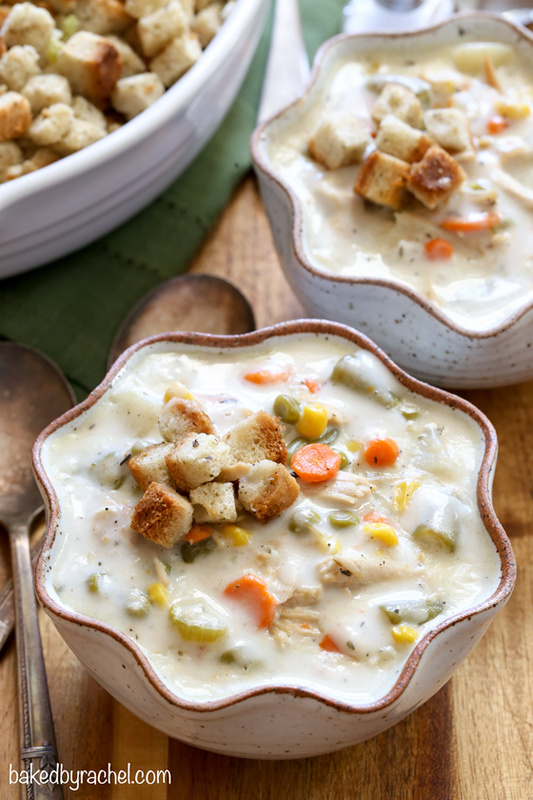 Easy and comforting slow cooker turkey pie soup, packed full of Thanksgiving leftovers! 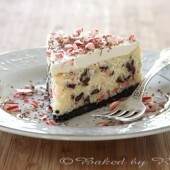 And if you’re not lucky enough to have leftovers, don’t worry, you can still make this! In fact, it’s an excuse to have a turkey dinner! 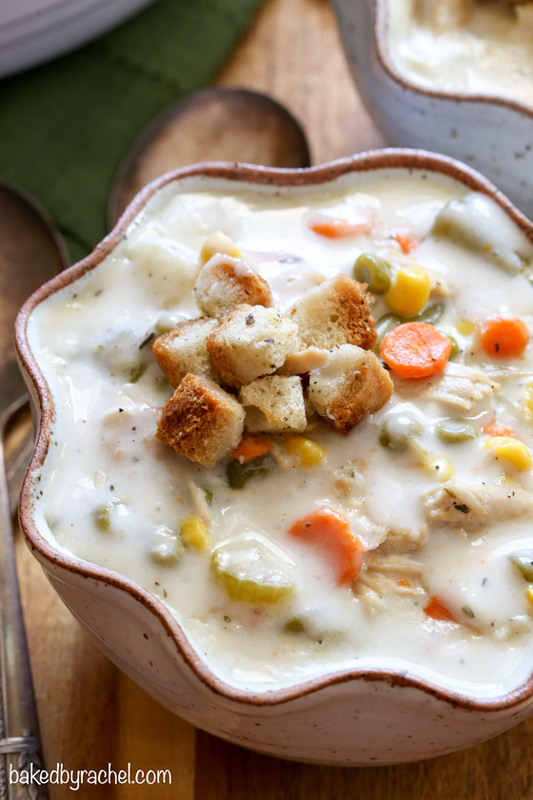 Add this comforting turkey pie soup to your dinner plans! The entire family will be asking for seconds! Shred or chop turkey meat. Chop onion, celery and carrots into small pieces. Peel and chop potatoes into small bite sized pieces. Measure out 1/2 cup each of corn, peas and green beans. Optionally, slice green beans in half width wise to create more maneagable spoon-size pieces. Mince garlic. To the bowl of a 5-6 quart slow cooker add prepared turkey and vegetables, along with salt, pepper, thyme bay leaves and chicken broth. Cover and cook on high for 4 hours or on low for 8 hours. 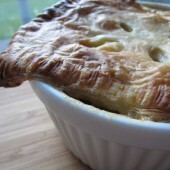 In a large measuring cup or medium bowl, whisk together flour and heavy cream until smooth. Pour into slow cooker, stirring to combine well. Replace cover and continue cooking for an additional 30-45 minutes. Serve warm, topped off with optional stuffing. **If you do not have leftover vegetables (peas, corn and green beans) use 1 1/2 cup total of fresh or canned vegetables. I am a total on-line shopper. The thought of going out and fighting the crowds just makes me tired. This soup is another reason to stay home on Friday! Looks delicious! I am NOT a Black Friday shopper. Even when I see a deal I really want…I just let it go. I can’t stand the idea of battling the parking lot and all those people! Whew. And yay soup! I’m all about the leftovers soup! Thanks Melissa! My brain always goes to the crowds and lines. I somehow forgot about the parking nightmares. Yikes! Love the sound of this! I love making soup at this time of year, even better if it uses my slow cooker! Sounds delicious! I’m so stinkin excited for the Gilmore Girls! My husband is probably dreading Friday, he’s not a fan of the show. 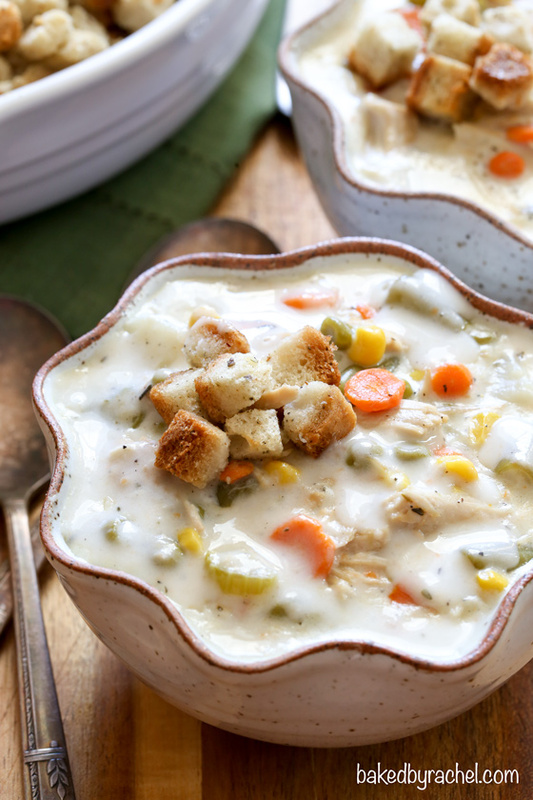 I totally want to sit on the couch with this creamy soup and watch it! WOW. This Thanksgiving leftover recipe is everything! It looks amazing!! I’m really not a Black Friday shopper, unless there’s something specific on someone’s list. Otherwise, I make a lot of gifts, gift a lot of my fave wines, and support local artists throughout the season when I can. I have to ask…where did you get your bowls?? They are adorable! I love things that break the norm and I love the curvy-ness of these! The bowls were discontinued several years ago.